Personalised Christmas Baubles - Australia Wide | Fast Shipping! 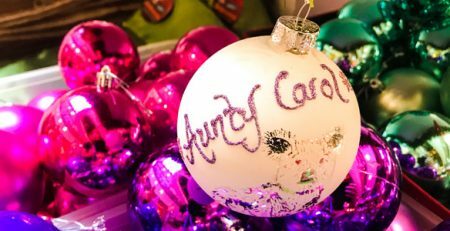 What are Personalised Christmas Baubles? Around 20 years ago we came up with the idea for Personalised Christmas Baubles, with a name and/or small message. Our clients buy personalised baubles for many reasons including commemorating loved ones who have passed, celebrating births, celebrating relationships, celebrating the year, gift for a teacher, gift for a friend, gift for a pet … the list goes on. Christmas Baubles have been a favourite decoration on family christmas trees for centuries. They are a real symbol of the feastive season and look great in all the various colours and sparkling glitter. Over the years we have watched our baubles grow in popularity and seen many of our customers return year after year for decades. All our baubles are very high quality and can be hung on the family christmas tree for decades to come if they are well looked after. All the messages on our personalised christmas baubles are custom handpainted right here in Sydney before being shipped to your door.